I had to buy some switches recently and needed to gather a second quote from another vendor. I went to the Dell website and was pleasantly surprised to quickly find a clear price and a buy-now button for each device on their website. Normally you’d need an account of the vendors portal to get this information, so it is refreshing to have straightforward access to clear hardware pricing. However it was the list of professional services options shown in the attached image that caught my eye. You can choose options for ‘rack and cable’ basic deployment or more comprehensive ProDeploy solution. The out-of-hours cut-over and other on-site planning options are a lot more expensive, but I’d imagine those tasks require more polished and experienced engineers to be engaged, and a lot more time-risk. Lastly you have the more tightly defined remote consulting options, with a 1-hour or a higher-priced 1-case options of the course of a single year. You could quibble with some of the prices but I was really surprised to see fixed pricing for professional services, presented in an easy-to-consume and transparent manner. I’ve always had an interest in business. 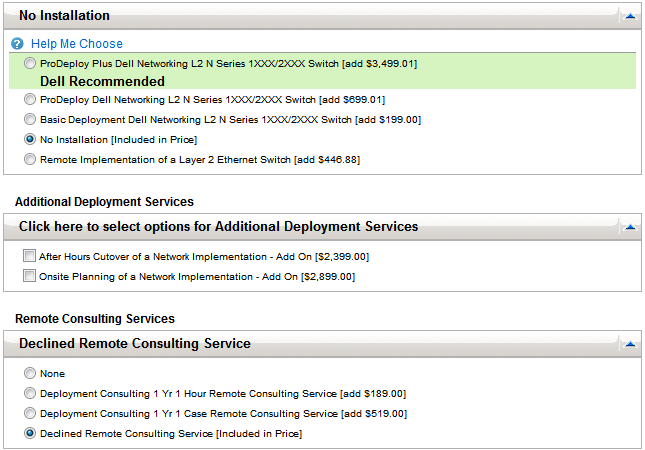 Now that I’m more focused on network consulting I’m paying very close attention to how consulting effort is estimated and priced and delivered. I love the idea of offering product-ized professional services. Of course there’s quite a risk with offering a fixed-price service. You need to put strong protections in place to avoid your engineers exceeding the effort you’ve priced into the offering. When it goes badly each engagement could become a loss-making opportunity. On the other hand, offering a fixed-price for a well-defined task provides a clear incentive for process improvement. Any productivity gains you make from refining your deployment process goes straight to your profitability. I’m going to dig deeper into this area. Do you have any experience with fixed-price or ad-hoc hourly network consulting engagements that you could share? I only have one experience with Dell’s service, so this is entirely anecdotal. First project as the new network admin, predecessor had payed for dell installation services prior to my arrival, so I figured why not have them help? This was replacing our fiber core switches and the engi on the phone was very knowledgeable and understanding. The configs he wrote were clean and worked well. The trouble was with the remote hands they sent out to blow on the config and rack the gear. Terrible personality, no understanding of what he was doing, couldn’t even communicate with my team or his. The real problems started when unforeseen issues (third vendor sent the wrong gear) started cropping up and it had to be communicated. The project was to span four days, I sent him home on day one because dell was just slowing the project down. Completed the project myself far more smoothly alone. I’ve dealt with other managed service’s on site engineers and they are usually knowledgeable and easy to work with, but my one experience with dell was enough to keep me away. Thanks for the feedback Mark. It’s quite valuable to hear the experiences of folks who have done it before. Interesting to see the varying skill levels of two engineers in a single engagement!